I’m certain my great-grandmother would be very confused if she found out that learning to can and preserve was a novelty for me. I never met the woman, but raising nine children in a very rural section of Mississippi would have made the process a necessity, not a novelty in her life. The reality of my life includes a farmers’ market almost every day of the week in the greater Los Angeles area as well as a 24-hour grocery store a mile from my house that carries every imaginable fruit and vegetable including corn and tomatoes in the dead of winter. I won’t comment on the flavor of those winter tomatoes, or the distance they likely had to travel to make it to my market but they’re there which means the thought of canning or preserving my backyard produce for use throughout the year has never been a priority of mine. This year, I’m determined to change that. It may be the expansion of the growing area in my backyard and the knowledge that if all goes well our garden really will runneth over this summer or it could be the impulse purchase of canning supplies on a recent Sur La Table trip; either way it was time to try my hand at canning. The garden is filled with more seedlings than actual food at this point in the season so I headed off to the farmers’ market in search of organic strawberries to make jam. 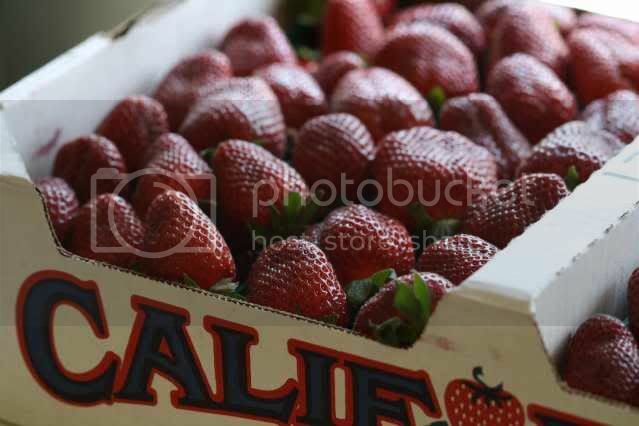 I found a flat of organic camarosa strawberries that the farmer was willing to let go for $20. He assured me that of his three different varieties, these strawberries would make the best jam. I used a recipe that was featured in a Los Angeles Times story on Edon Waycott, the woman who makes jams for La Brea Bakery. 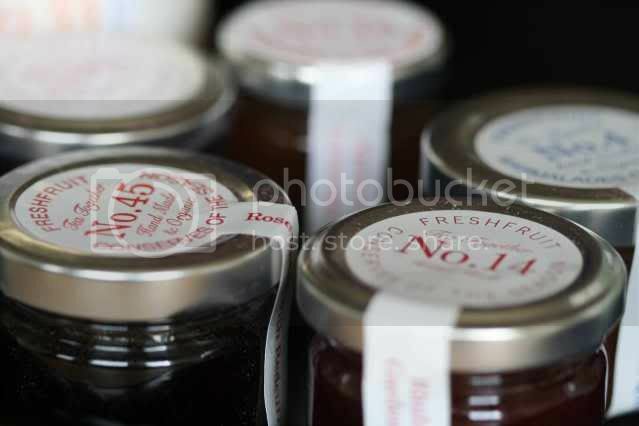 I figured if her preserves were good enough for Nancy Silverton, then they would certainly pass muster in my kitchen. The process itself is very simple, just slightly time consuming. The strawberries are hulled, left at room temperature while they macerate in lemon juice and sugar and then cooked down over medium heat until they gel. The jam is then cooled slightly before starting the canning process. Full instructions for canning can be found here. Just keep in mind that you shouldn’t touch the jars, especially their lids, until they are completely cool. And that popping sound you hear coming from the kitchen? Don’t worry, those are the lids sealing shut, not popping open. For a seasoned canner, I’m sure that seems obvious, but for this beginner those pops sounded like the whole process going to ruin. *Be sure to keep reading after the recipe for info on the best store-bought jam I have ever tried. Rinse and hull the berries. Combine the berries, sugar and juice in a nonaluminum bowl and let them sit at room temperature, stirring occasionally (once an hour or so), for 3 to 4 hours (after the strawberries had macerated for 4 hours, I covered them and put them in the fridge overnight to allow plenty of time the next day for the cooking and canning process, but this is not necessary). Scoop the strawberries and their juices into two wide, shallow saucepans (or one if you have a pan that big) and place over high heat. Bring to a boil, skim the foam that collects on the surface, then reduce the heat to low, making sure the mixture continues to simmer. After 20 - 30 minutes, the berries will give up additional juices. When you notice the extra liquid, continue cooking and skimming the foam for another hour. Let the mixture cool slightly before continuing with the canning process found here. The preserves turned out deliciously. I was a bit concerned that the whole mixture was too runny and didn’t look as thick as store-bought jam, but lucky for me, providence stepped in. 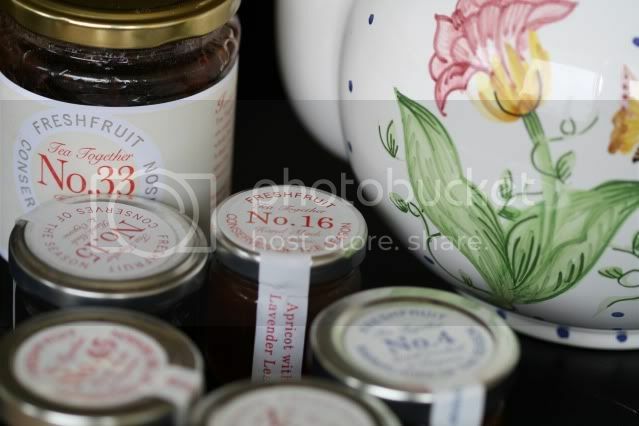 The day after I finished making my preserves, I was contacted by a company called Tea Together. They make small-batch, handmade organic jams, preserves and chutneys in Northern France and wanted to send me some samples to try. Having just finished my own batch of preserves using organic fruit, I was thrilled to have something from the professionals to compare it to. I had no idea what I was in for. After reading that quote, I knew I was in love. How could you not be drawn in by a company that feels that way about food? And trust me, that philosophy is apparent in their jams. They don’t seem processed or mass-manufactured at all. It’s as though your mother sent you a bottle of homemade preserves and your mother is the best jam maker you have ever met. I knew we (the boyfriend and I) had to hold a taste test for the other products, so I made a batch of these scones and down we sat, resigning ourselves to the fact that we would have to spend the morning eating some of the best jam I’ve ever laid my hands on, slathered all over fresh-from-the-oven scones. Poor us. 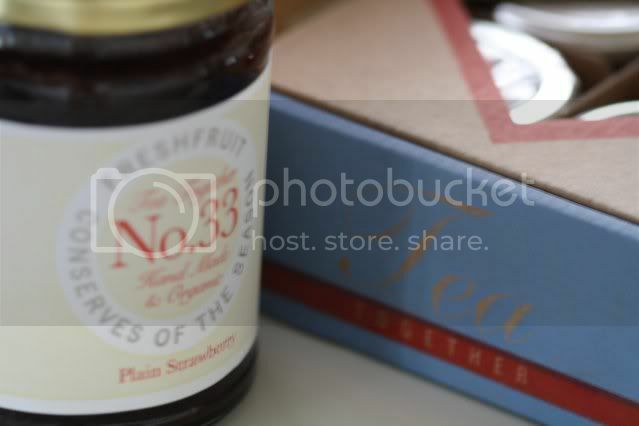 My favorites are #33 (strawberry jam) and #14 (rhubarb, lemon and angelica). The boyfriend, with his British roots, fell in love with #15 (summer pudding with vanilla pod) based on the British dessert, Summer Pudding (note to self, make Summer Pudding for the boyfriend). Did I mention the founders are British ex-pats? That helps to explain the delightful British aesthetic of the packaging. In case it wasn’t already abundantly clear (PG Tips, boyfriend’s British side of the family, inappropriate squeals upon hearing someone say “the tube”), I’m an anglophile. You can check out the company and products online at Tea Together or, if you happen to live in New Jersey, they’ve just opened a shop in Millburn. If you’re lucky enough to live in France, be sure to check out the list of local French suppliers. The jams are not cheap, but if you share my philosophy that good food costs money and that the artisans who create flavorful, good-quality food products deserve to be compensated for their efforts, then the cost will not seem off-putting. If you have yet to be convinced of this philosophy, I suggest you plant an edible garden. The flavor of the fruits and vegetables you get from your own yard will far surpass that which you find in the grocery store, but the real lesson will be in the amount of work it takes to get those plants to production stage. It certainly opened my eyes to the hard work of farm life. By the way, no judgment here at all - we’re all watching our pennies these days, but for something this special, I’m willing to splurge. Maybe you are too. Lovely photos to accompany great thoughts. Not sure if I have the gumption to try to make jam, but it's certainly inspired me to think about doing so! I think your jam looks gorgeous and I bet it tastes damn good too! I learned to can last year with my Minnesotan in-laws, and let me tell you, those summer canned tomatoes kicked the butts of the grocery ones right back to where they came from! Lovely photos and a great post. I love to make jams and jellies. About 5 years ago I started to make freezer jam, not for its simplicity, but rather for its color. They perk up breakfast during our gray Oregon winter. This looks so good! I actually have a strawberry patch in my yard, they'll be ready in another month or so, and you can bet I'll be making jam. I've seen quite a few fellow bloggers make jam over the last couple of years but have yet to consider it. You make it sound so worthwhile. The attitude of Tea Together is really lovely. And I am willing to pay more for what I consider quality, though certainly I am extremely grateful to be able to afford to do so. I'm craving toast and jam now. Mm. Ooh - delicious! What other varieties of strawberries did your guy have? Most of the farmers I've seen carry Camarosa (which are also less expensive), but I've become spoiled by Harry's Berries, and their Seascape and Gaviota berries. I've been contemplating making jam myself, but the canning process intimidates me. I've read somewhere that you can prepare the jars for canning in the dishwasher, and they do seal that way (I've made chutney before). 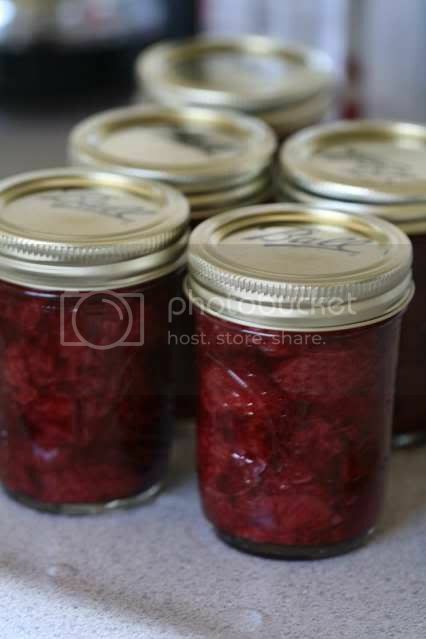 I just cleaned out my local Whole Food's stock of frozen rhubarb, I'm thinking I may have to put away some rhubarb jam. The Tea Together jams sound fantastic...and yours looks just great! Oh, strawberry season. Heaven! When I was a tween and living on the East Coast my mum and I used to go to the strawberry fields as a treat from time to time. What sweet memories. Wow, your blog is beautiful! And, your jam recipe sounds lovely. The strawberry jam looks delicious! The photography on your blog is beautiful! Thanks for visiting my blog - glad to discover yours! I'm Sorry... Kiss and compliments I see you. Your jam (and theirs) look beautiful. I love to make jam...and am so very excited to hear that tell-tale "ping" as the jars seal. I love that you use such seasonal ingredients! I just went and got fresh strawberries from a far down the road...I am considering getting more to make up this jam! I'm so impressed you made your own jam! Just looking at it is making my mouth water - yum! If I got my stuff together, I'd try this on a freshly baked buttermilk scone topped with your home-made chevre. What a great post - so informative. I have been intimidated by the jam making process. After reading this I will have to put it on my to-do list as it doesn't seem difficult, just lengthy (but worth it). Thanks so much for stopping by my blog. I went through your last few months of posts and I can't wait to read more. How wonderful to make your own homemade strawberry jam! My grandmother used to make it all the time, but I never have, I might try soon! After reading a few of your post I can't decide which one to comment on because each one is better than the next! I love fresh preserves, though I've never made them. Great on homemade bread! A girlfriend of mine recently inherited her mother's canning tools/supplies, and we’re completely stoked about putting them to use. We both have vegetable gardens going and have compiled a long list of things to can/preserve. Can't wait! P.S. Do share if you find a good source for jars and lids. Thanks! Great post!! Strawberries are just in season in Belgium now!! So, I know how to capture them!! Looks delicious, your strawberry jam! Great pictures again, as always!! All through my childhood my mother hauled us to the U-Pick fields for strawberries, followed by a day of canning in the kitchen. Once we got a chest freezer in the basement she go lazy and started freezing the jars instead of doing the old fashioned canning route. Since we don't have a giant freezer though, I've been mulling the idea of going old school. I hope mine turns out as well as yours. Yum! I've never made my own jam, but once my friends made homemade strawberry jam for me for christmas, and it was heavnely! so different from store-bought ones! I'm baking some bread right now and could certainly use some jam to go with it. I love that this recipe doesn't use pectin either and I agree that homemade (or at least the farmers market variety) is so much better than store bought. Homemade strawberry jam is always a perfect treat. I am going to have to check out Tea Together...sounds wonderful! I learned to make jam this summer! It's a really great experience... don't you think? I do happen to live in France, so I'll be checking out the French suppliers. Thanks! I applaud you, as I cannot bring myself to make canned goods, as I live in terror of "The Botch". Sigh. The perks of bravery, I suppose. You get delicious jam, and I get...jarred, sugar enriched goop. I just found your blog today and it looks a lot of fun. Such great ideas and photos. I look forward to hearing about your foodie adventures. You dwarf Martha Stewart in terms of your ingenuity! First, I was floored by your chevre post, and now I have tears in my eyes from your strawberry jam. I can't wait until you open a store and ship to SF! That's so funny. I think my grandmothers would be amused at my cooking "hobby" as well. I've never tried canning or making jam, but I'd like to. Homemade jam is the only way to go! Love yours! 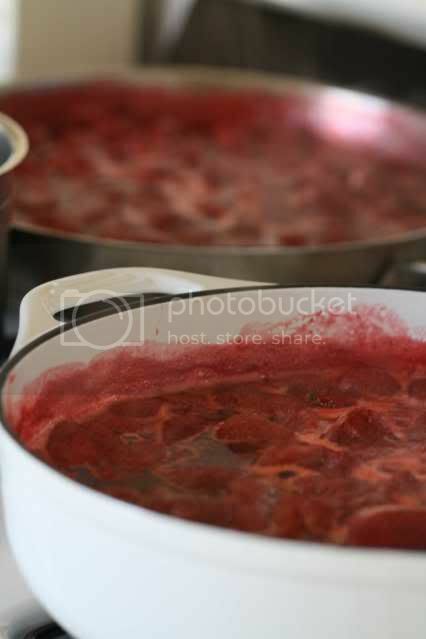 Your post took me back to summer canning in my Nana's kitchen. Beautiful! I hope you keep up the canning. It's always Zen-like. I can't wait to stop by Tea Together next time I'm up that way. Thanks for the tip. Thanks for this beautiful post and the great links too. I needed some motivation to get preserving as I have just discovered a wild lilly pilly on our farm and it is loaded with fruit. I hope I achieve results as beautiful as you have.